Before becoming a star in American films, she had already been a leading actress in Swedish films. Her first introduction to American audiences came with her starring role in the English remake of Intermezzo in 1939. In America, she brought to the screen a "Nordic freshness and vitality", along with exceptional beauty and intelligence, and according to the St. James Encyclopedia of Popular Culture, she quickly became "the ideal of American womanhood" and one of Hollywood's greatest leading actresses. Her producer David O. Selznick, who called her "the most completely conscientious actress" he had ever worked with, gave her a seven-year acting contract, thereby supporting her continued success. 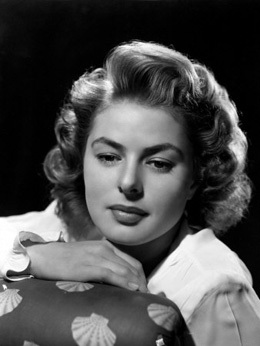 A few of her other starring roles, besides Casablanca, included For Whom the Bell Tolls (1943), Gaslight (1944), The Bells of St. Mary's (1945), Alfred Hitchcock's Spellbound (1945), Notorious (1946), and Under Capricorn (1949), and the independent production, Joan of Arc (1948). In 1950, after a decade of stardom in American films, she starred in the Italian film Stromboli, which led to a love affair with director Roberto Rossellini while they were both already married. The affair created a scandal that forced her to return to Europe until 1956, when she made a successful Hollywood comeback in Anastasia, for which she won her second Academy Award, as well as the forgiveness of her fans. Many of her personal and film documents can be seen in the Wesleyan University Cinema Archives.